Salvation And Survival: New Terminology: What Is The Meaning Of "Space To Destroy"? New Terminology: What Is The Meaning Of "Space To Destroy"? Let me be clear ... I am merely a simple woman who relies on my spiritual discernment to instruct my thoughts and opinions. I do not claim to be perfect, but when I hear something more than once on the same day, I tend to see it as an affirmation of something that is, at the least, reasonable to consider. Yesterday, on the front page of the Drudge Report was an article titled, "The Odd Tactic of Giving Baltimore Protestors 'Space' to Destroy". Also, yesterday, I heard a recording from Bastrop, TX, in which a spokesperson at a meeting between the public and officials with the Jade Helm military exercises announced that "space would be given to both protestors and those who wish to destroy". That just seems so counter-intuitive to the nature of peaceful protest, does it not? So why would this particular terminology be used? I understand the anger and confusion over the mysterious death of Baltimore resident Freddie Gray. There seem to be no concrete explanations as to how his fatal back injury occurred. It is natural for citizens to demand answers and to express their outrage publicly. Similarly, there is much confusion and suspicion over the explanations given for the military exercises known as Jade Helm, especially in Texas. So, what might the two events have in common, and why would comparable language be used in describing what law enforcement and city/county governments will allow? Could it be that once it is established by local law that protestors have been given "space to destroy", any attempt by property owners to defend their possessions or premises will be against the law? The mayor of Baltimore was quoted as saying, "We work very hard to keep that balance [between free speech and destructive elements], and to put ourselves in the best position to de-escalate." Are we to interpret that to mean that some destruction of personal property is permissible in order to guarantee free speech? How much is too much destruction? What rights do property owners have to protect their property against public -- but government-condoned -- destruction? It would appear that we are once again blurring the line of the original intent of our Founding Fathers and what the new "intellectual" concept of government is becoming. According to the Foundation for Economic Education, "The Founding Fathers upheld the economic view of property. They believed that private property ownership, as defined under common law, pre-existed government. The state and federal governments were the mere contractual agents of the people, not sovereign lords over them. All rights, not specifically delegated to the government, remained with the people–including the common-law provisions of private property. Consequently, the constitutional rights regarding free speech, freedom of religion, the right of assembly, and private property rights are all claims that individuals may hold and exercise against the government itself. In brief, private property refers to the rights of owners to use their possessions which are enforceable against all nonowners–even the government." Then there is the specific terminology in the Fifth Amendment, which states, "No person shall be ... deprived of life, liberty, or property, without due process of law; nor shall private property be taken for public use, without just compensation." I know that in the use of private property for the Jade Helm exercises, it is being promoted that land owners approached the government offering the use of their property. I know that at least in one instance, this is not true. The property owner was approached by representatives of the government. So, by declaring that use of the land was consensual, is this a way to avoid reparations in case the "space to destroy" gets out of hand? In effect, does it do away with the rights of property owners to defend themselves? And what of the store owners and shopkeepers and homeowners in Baltimore? 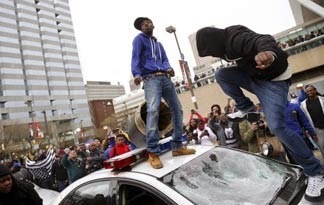 If protestors are given a license and "space" to destroy, how will they be compensated for damages to their property? What rights do they have to protect their personal property, if the City of Baltimore has established a right and space to destroy? In fairness and honesty, I will tell you that the Mayor of Baltimore has attempted to clarify her statement by saying that there was never any intent to suggest that those seeking to incite violence also had the space to operate. I certainly should hope not! But we all know that once that impression has been conveyed to the public, there is no taking it back. You must decide for yourself if it was intentional, or not. The bottom line is this: All Americans should have the opportunity to voice their opinions peaceably, while respecting the laws of the nation and the private property of individuals. That being said, I suggest that officials carefully consider how their terminology will be interpreted. I cannot imagine any manner in which "peaceful protest" and "space to destroy" belong in the same sentence! Isaiah 64:6 "We have all become like one who is unclean, and all our righteous deeds are like a polluted garment. We all fade like a leaf, and our iniquities, like the wind, take us away."